In the immortal words of Homer Simpson “DOOHPH” Really young beer drinkers binge-drink more frequently. Did we really fund a study for this? Binge drinking is definitely an issue; Wisconsin has the highest binge drinking rate (25.6%) in the nation. Binge drinking is defined as five or more drinks per occasion for men and four or more drinks for women. The state also has the highest intensity of binge drinking, with binge drinkers reporting an average maximum of nine drinks per occasion. Wisconsin has $6.8 billion cost estimate includes lost worker productivity ($2.9 billion), premature death ($1.9 billion), health care costs ($749 million), criminal justice system costs ($649 million) and motor vehicle crashes ($418 million). The report was produced by researchers at the University of Wisconsin Population Health Institute in Madison, who calculated both the financial burden and who pays it. 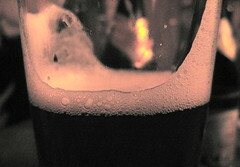 Young beer-drinkers binge-drink more frequently. Is Grandma a Binge Drinker? Time at the Bar for Britain’s Binge Drinkers?